Project Pride has been busy this last week sending out the annual Howard Days flyers. They do this to jump start the Pre-registration process, to get a handle on how many folks they might expect this year. But, the primary reason Project Pride asks for a pre-registration is to get a count of how many people they expect for the Friday night Celebration Banquet, held at the Cross Plains Community Center. Seating is limited there to about 125 (although they always manage to squeeze in a dozen or so more) so it's important to register early! Besides the great Texas grub, the Silent Auction takes place during and after dinner. There are always great and unique Robert E. Howard items available at the Auction; you write your name and bid on the bid sheet and if your name has the high dollar you win the item. There are always some good-natured bidding wars going on and the best part is that all the proceeds benefit the Robert E. Howard Museum. Now, the best part of all this is while yes, there is a pre-registration cost for Howard Days, it is ONLY for the Celebration Banquet food - a plate at the banquet. ALL the activities at Howard Days are presented free of charge: the Museum is open all day Friday and Saturday, the Pavilion is available for all (donations for the Friday lunch and soft drinks are appreciated), the panels at the Library and other places are at no cost. Actually, the $15.00 per person charge includes donuts & coffee plus the cook-out lunch at the Pavilion and then the Celebration Banquet, all on Friday. The Saturday night Sunset BBQ at the Caddo Peak Ranch is compliments of the owners of the ranch, Janet Swanson & Marsha Murray. So, time's a-wastin'! You can send your pre-reg money ($15.00 per person) to Project Pride, POB 534, Cross Plains, TX 76443 or make a Pay Pal payment to ProjPride@yahoo.com. 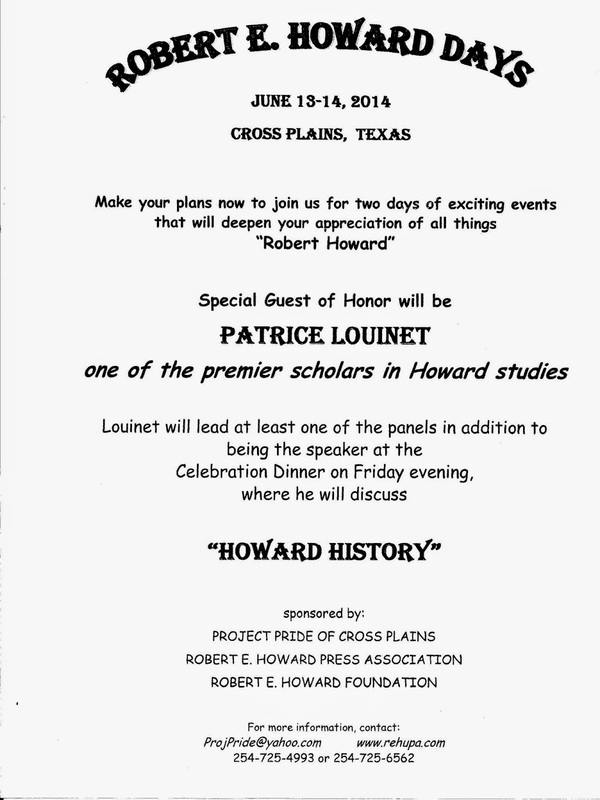 Looking forward to seeing a passle of y'uns at Howard Days - The Best Two Days in Howard Fandom!